Today I wanted to talk about something a little taboo (I guess we’ll just keep with the theme, since today’s mid-day post was a bit taboo, also). Do you ever talk with your friends about money? Not just casual mentions of money, but deeper conversations about budgeting, debt payments, financial goals, etc? Confession: when I first started blogging here I hadn’t ever talked about money (on a deeper level) with any of my friends, ever! It made for a challenging transition from my old spending habits to my newer (more frugal) ones. Eventually I slowly started talking a little bit about how I’ve been working to pay down our debts. One of my friends, in particular, has been really kind about my debt reduction mission. She still doesn’t know specifics (exact figures of debt versus monthly payments, etc. etc. ), but she knows that I’ve become much more money-conscious (side note: she’s actually made innocent comments occasionally about how “tight” money is right now in our household. LOL! If she only knew the truth = that we spend $2,000/month on DEBT!!!). This friend and I used to get together nearly once a week for lunch or a happy hour and, instead, we now get together to do a little 3-mile walk/jog on a popular jogging trail here in Tucson. I love it because I’m able to get some exercise and some girl talk all at once, and to do so for 100% free! But still….no one knows the extent of our debt situation, nor the sacrifices we’ve made to really try to chip away at our debt. I have a different friend that I was chatting with the other day. She and her husband were preparing their taxes and realized that last year they’d had a dramatic income boost – 33% over the previous year. The scary part is that she said she has absolutely NO IDEA where the money has gone. They still have the same living arrangements (same modest apartment, same old car, no new baby, same basic “stuff”), so it’s not like their expenses have gone up. Just…the money has disappeared. So after hearing all this, where does the conversation go from there? I know my friend has some debt (student loans at a minimum, though I don’t know specifics about other consumer-related debts), and I want her to win with money! I wanted to tell her all about what I’ve been doing, to encourage her to examine her spending, make a budget, try to cut back, etc. etc. etc. Only…I didn’t feel comfortable to do so completely unsolicited. I did mention that I’d been working really hard this last year to pay off debts by really trying to stick to a budget (hoping this would open the door for more questions), but the conversation just kind of ended there. She picked up with a different topic. So what would you do? Do you talk to friends about money? Would you ever do so unsolicited, or simply wait to be asked? It feels like a weird topic (kind of like trying to push your religion on a friend), but I’ve just felt so thrilled with my progress this past year and I really WANT my friend to do well financially, too! Especially with their big income boost, they deserve some financial wins, you know? But it’s definitely still so taboo. How do you feel about the topic? Would you talk to your friend(s) about money? Would you try to encourage them to get on a budget, or just let them see how you live your life (with the hopes that one day they ask about your success)? Lead by example. It just isn’t your business. Maybe after you are consumer debt free you can share that fact and you may inspire a conversation but really leave it. I think I would have said “You know I used to be the same way. Now, I blog to hold myself accountable. 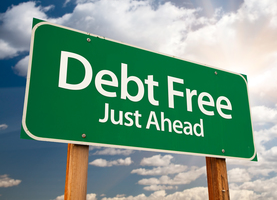 You should check it out: Blogging Away Debt.” Then let it go. I talk to friends about money in as much detail as possible, without being overbearing. I’ve found this to be easiest when you reach a milestone and can say something like “I finally paid off my car, and I swear it drives smoother knowing that it’s completely mine! I’ll never have another car payment”. Something like that usually opens the door for additional questions. If your friend doesn’t ask any questions, she may just be truly uninterested, and the discussion probably ends there. My guess is you’ll get one of two categories of responses, either the “Oh, you’re interested in personal finance too!” or “That’s good for you, but I’ll always have a car payment, I don’t even want to think about it.” My guess is that your friend is in the second category. It’s a tough question! I have a friend who has told me flat-out that she’ll “never have money,” so there’s no point in tracking their spending, etc. In fact, talking about money freaks her out completely. If she covers the cost of something, she’d almost rather have you never bring it up and never pay her back if it means avoiding the “how do we divide the check?” conversation. I’ve tried to be more sensitive to this (as I’m TOTALLY a “how do we divide the check?” person! ), but I have ventured a few suggestions here and there about discussing her finances with her spouse (who handles almost all the money). The situation is more complex than I am laying it out here, but that’s the gist of it. Awkward! I like broaching the topic gently if it comes up in conversation to see where people stand. I like to hear about their debt repayments (if they’re willing to share, though I never ask for specifics) or their savings vehicles (“Oh, I have a Roth IRA, too!”), or their long-term plans. It’s definitely some voyeurism there, I guess! I am like you – I would talk to everyone in the entire world about personal finance and how paying off my consumer debt made me feel like superwoman and living off of 50% of our income has been one of my life’s greatest accomplishments 😉 So it is a bit braggery/prideful of me but it is also because I want everyone to be awesome at money so we can high-5 in the streets when we walk by each other with super awesome music playing in the background. It can be weird to talk about money with some unsuspecting friends. When I talk about money with friends, I try to always lead with how far I have come and hopefully acknowledging my past misadventures in personal finance helps whoever I am speaking with feel they can be open and honest. I never say, “you should do this” rather I try to speak about what worked for me. Also, sometimes just listening to a friend speak about their experiences can be enough: When I was battling my consumer debt, I never felt so alone or ashamed and I was sure if the debt didn’t break me, then the all-consuming self-hatred would swallow me whole. I wish it would have been easier to talk to a friend about it. I’m also in the talking about money crowd. When I was paying off my student loans, I divulged to a friend and he was paying off a credit card. We tracked our progress together and discussed our strategies every day. It was a really positive experience. I am a huge advocate of the 15 year mortgages and will share my amortization tables with anyone who mentions buying a house. I also have an awesomesauce loan comparison sheet that makes it easy to compare either mortgages, credit cards, car loans, whatever. I recently sent my sister-in-law my cash flow template. As a tax accountant, I also discuss tax strategies ad nauseam. I hope people start discussing money. It empowers all of us to be in control of our finances rather than letting our finances control us. Like most commenters here, I have found it very difficult and a bit strange to talk about money with most people. Most just seem to not want to touch the topic in a serious or fruitfull way. So I have given up sharing my succeses and failures. If somebody is really interested how we managed to retire at 41 I will explain in one sentence: for 13 years we both worked a full time job, lived on one income and invested the other income in the stock market. This answer usually either stops any further conversation or people focus on the fact that I must have been lucky with my investments. Getting payed dividends seems to be a very alien concept to almost everybody I know. All in all I know 4 people with whom I had serious discussions on money in the last 20 years. WHOA!!! Jerome, that is awesome!!! You are living the dream, my friend! So proud of you, and wish I could say the same for my family! What an inspiration! I know retiring at 41 is not going to happen for us, but maybe one day we can still retire early and follow a bit in your footsteps!